Writing unique product descriptions for your Shopify store will help your customers make better buying decisions. When you write descriptions that connect with your buyer you’re making it easier for them to choose you over the competition. Now you don’t have to re-write every single product description on your site, start with the top 20% of products you are selling. If that’s where the eyeballs are already going, rewriting those descriptions will be your easiest wins. Now something I should mention before we get into writing better product descriptions is real businesses take real work. What I mean by that is if you want to be one of people that actually excels in building an online business (one that you can live off of save for your future), then you actually have to do the work. And that’s just not how it works. There’s real work involved with building a highly-successful drop shipping business. So in this blog post, I’m going to give you a high-level overview of what product descriptions will look like if you’re willing to take that extra step and actually build a store that has a chance at winning. Tip: If your store has been up and running for a while, I suggest focusing on improving the product descriptions on your most-viewed products. Use Google Analytics to find out which pages get the most views. Below is a screenshot of a product page from one of our demo Drop Ship Lifestyle stores. The description, features, benefits, and even the product photos come straight from the manufacturer. ​Typically when you get approved with a dropship supplier, they’re going to give you either a CSV or PDF file with all the details. They’ll send over everything such as pricing, descriptions, image links, and specifics. Now here’s the problem with that… While on one hand I’m grateful because this information is a great starting point, it is stock information. It’s generic, everyone selling these products, all of the competitors, are using these descriptions! If you copy and paste this product description into Google, you will find similar pages on competition pages like Home Depot, other dropshipping stores, and even Petco. Having competition is fine if you’re planning on becoming an internet retailer for other brands. But one way to stick out from the competition is to use unique product descriptions. Why are Unique Product Descriptions Important? 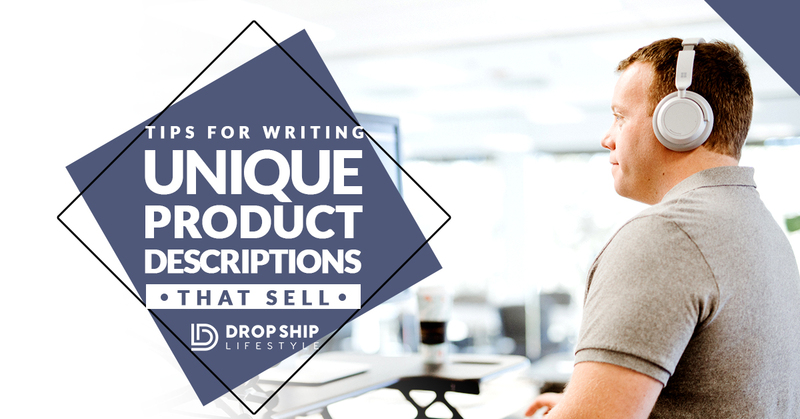 There are a few different reasons why you’ll want to write unique product descriptions. I just mentioned that it helps you to stand out from the competition, but there are a few other reasons you might not have thought of. First, unique product descriptions are going to boost your conversion rate. When you’re rewriting the stock product descriptions, you’ll want to educate customers and answer any questions they might have about the product. Following my method of dropshipping, most of the time, when people come to our stores, they’re very close to making a purchase and not just ‘window-shopping’. Another big reason for unique product descriptions is Google. Google loves unique content. If ​Google sees that several websites are selling a certain product, but your page is the only one with unique content then ​they'll prioritize your site in the search results. Improve time on-page and bounce rate and Google will love your website even more! This is one tip that will come with time, but once you’re in business and converting visitors into customers, you’ll start to pick up on what customers are looking for in a product, and what are the common questions. ​This stroller is great for large dogs. It features a sturdy frame and rides low to the ground for easy, front entry. ​The Pet Gear Expedition Pet Stroller is one of our top sellers and most loved products. It’s big enough for a large dog, but compact enough to put in your car as you head out to the park or to the mall for some shopping. ​You don’t have to reinvent the wheel! Improve off what you have. Start with the stock descriptions and make those unique. Add more adjectives to it, make the descriptions more personal, and relate the copy to the product images the customers will see. ​Tip: Play into the images on your Shopify product pages, because those are what the customers see first. It has a waterproof floor, front swivel wheels, rear brakes, and bug proof mesh that provides air circulation. 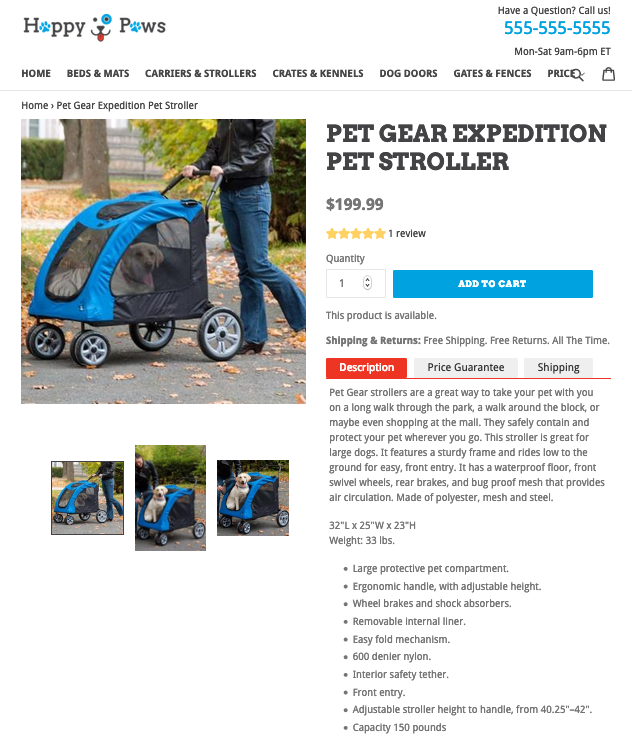 The Expedition Pet Stroller is constructed from a steel frame with a polyester and mesh cover to ensure it’s sturdy and safe, but also breathable and light. It also features rear brakes to make sure your dog stays put. When you’re improving product descriptions, one of the easiest changes you can make is transforming the features into benefits. As always, keep your customer, and what they would want, in mind. Take a look at the list below and see how the before features were transformed into specific, detailed benefits. Large protective pet compartment to hold even the biggest dogs! Ergonomic handle, with adjustable height so anyone in your family can use it! Wheel brakes and shock absorbers to ensure a smooth ride for your pooch! Removable internal liner so it’s easy to clean after a big day out! Easy fold mechanism so you can store it small spaces! 600 denier nylon which is built to last! Front entry so your pup can get in and out with ease! ​That removable liner? That’s there to make the pet stroller easy to clean. Easy fold mechanism? That means you can pack it up and take it with you on the go. Small changes here can make a big impact on boosting your conversions. A great way to create a unique product description is adding a personal ‘Note From The Staff’. Now, you could use a person’s name instead of ‘staff’. And when I say name, one thing I like to do is create a brand representative avatar. If this website we are using was a real example, I would probably use my own face and name, so it would say instead “A Note From Anton”. ​A Note From the Staff: What I love about the Expedition stroller is how easy it is to clean. After taking our older dog to and from the lake in this thing all I have to do is spray it down with a hose in the yard, leave it out to dry, and then it’s like new again! ​​Y​​​ou shouldn’t make something up or pretend the product does something it doesn't. The best way to come up with this part would be to use data and comments from customers. You could find these in product reviews, manufacturer notes, or other places online. Either way, you definitely want to put your time into researching things like this when you’re rewriting your product descriptions. These personal touches really make a brand stand out. Most other drop shipping stores don’t do these things. Doing this in your store however, will instantly connect your brand with the buyer. ​This product is in stock now and can be delivered in 3-5 days. Click ‘Add To Cart’ now to place your secure order and we will send you a tracking number within 24 hours. ​Tip: Now, for our businesses, when we're rewriting product descriptions, I'm not usually the one that does this. In the beginning, I did everything myself, now I outsource tasks like these and I would recommend you do too, if you want to do it for a massive product catalogs. And a good way to do it is have your VAs do it in a Google Doc like this so you can review it from here. Once you sign off on it, they can move it over to your website. Research to find out what buyers are saying. And I’m sure if you haven’t done any of the above yet, this blog post is a big wake up call and eye-opener to what you can do to instantly stand out, have Google rank you better so you have better traffic and have better buyers. 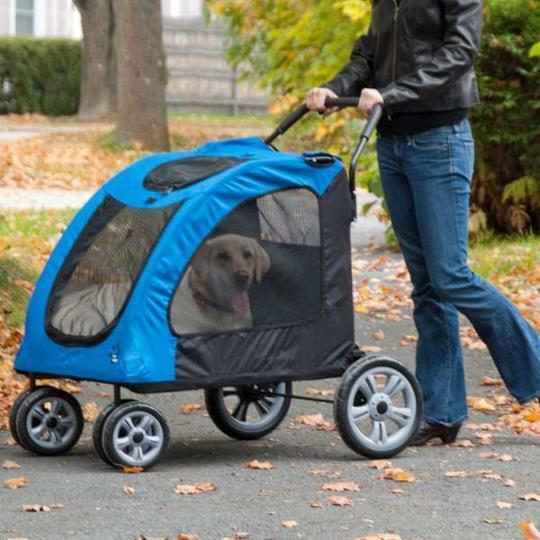 ​Pet Gear strollers are a great way to take your pet with you on a long walk through the park, a walk around the block, or maybe even shopping at the mall. They safely contain and protect your pet wherever you go. This stroller is great for large dogs. It features a sturdy frame and rides low to the ground for easy, front entry. It has a waterproof floor, front swivel wheels, rear brakes, and bug proof mesh that provides air circulation. Made of polyester, mesh and steel. The Pet Gear Expedition Pet Stroller is one of our top sellers and most loved products. It’s big enough for a large dog, but compact enough to put in your car as you head out to the park or to the mall for some shopping. The Expedition Pet Stroller is constructed from a steel frame with a polyester and mesh cover to ensure it’s sturdy and safe, but also breathable and light. It also features rear brakes to make sure you dog stays put. What I love about the Expedition stroller is how easy it is to clean. After taking our older dog to and from the lake in this thing all I have to do is spray it down with a hose in the yard, leave it out to dry, and then it is like new again! This product is in stock now and can be delivered in 3-5 days. Click Add To Cart now to place your secure order and we will send you a tracking number within 24 hours. I’m studying your offering and I am considering purchasing your course blueprint. I still have questions about sourcing suppliers and how independent online resellers that are start-ups can get approved by the mfg and buy at a discount. There would seem to be some challenges there that look to be hard to overcome. Am I wrong in this assumption? This is covered in Module 4 of the blueprint 🙂 I give you my scripts and tell you exactly how to get approved with the best suppliers.